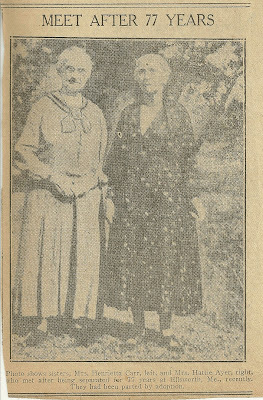 Newspaper clipping of unknown age found in the diaries of James Moore and his daughter in law Vesta Estella (Garland) Moore of Lakewood, an area near Graham and Green Lakes in Ellsworth, Maine. The diaries run from the late 1800s to the 1940s, in five separate books. 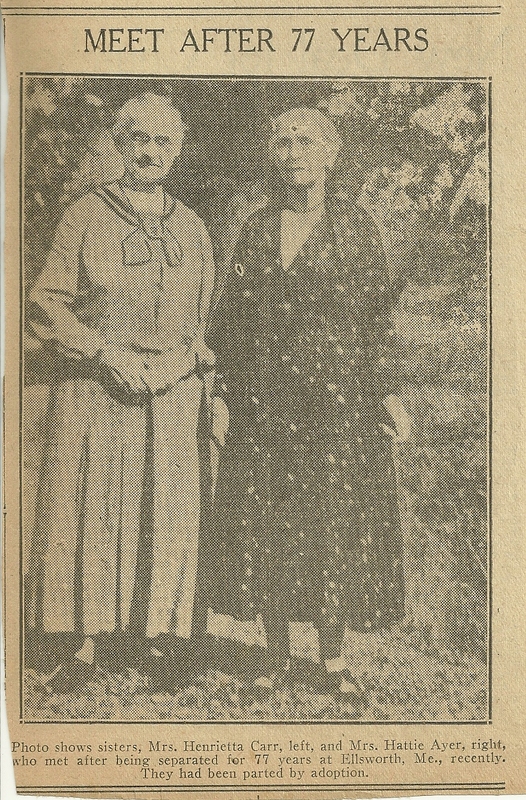 The caption: Photo shows sisters, Mrs. Henrietta Carr, left, and Mrs. Hattie Ayer, right, who met after being separated for 77 years at Ellsworth, Maine, recently. They had been parted by adoption. I found several possibilities for Mrs. Henrietta Carr: married to Enoch Carr; married to Rufus Carr; or married to Richard Carr. For Hattie Ayer, I found possible husbands: Richard and John. But their husbands could have been entirely different men. I'm hoping that this story will strike a nerve in a reader who will then forward an answer to the mystery and, hopefully, their ancestry by birth and by adoption. I'm not sure what relevance Ellsworth, Maine has in this story. They apparently reunited at Ellsworth, but whether they were born there or not, I don't know. And I don't know if they have any relationship to the Moore and Garland families of Ellsworth, Maine. If you have any insights into this clipping, please leave a comment or contact me directly. Thanks!